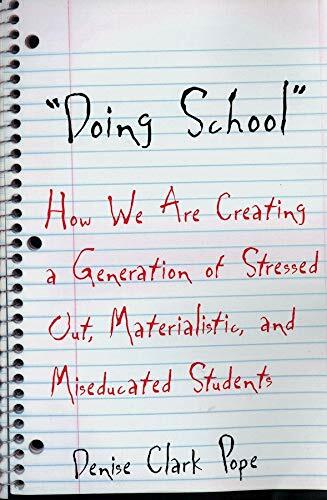 This book offers a revealing-and troubling-view of today's high school students and the ways they pursue high grades and success. Veteran teacher Denise Pope follows five highly regarded students through a school year and discovers that these young people believe getting ahead requires manipulating the system, scheming, lying, and cheating. On the one hand, they work hard in school, participate in extracurricular activities, serve their communities, earn awards and honors, and appear to uphold school values. But on the other hand, they feel that in order to get ahead they must compromise their values. In short, they "do school"-that is, they are not really engaged with learning nor can they commit to such values as integrity and community. The words and actions of these five students-two boys and three girls from diverse ethnic and socioeconomic backgrounds-underscore the frustrations of being caught in a "grade trap" that pins future success to high grades and test scores. Their stories raise critical questions that are too important for parents, educators, and community leaders to ignore. Are schools cultivating an environment that promotes intellectual curiosity, cooperation, and integrity? Or are they fostering anxiety, deception, and hostility? Do today's schools inadvertently impede the very values they claim to embrace? Is the "success" that current assessment practices measure the kind of success we want for our children? A revealing, and troubling, view of today's American high school students and the ways they pursue high grades and success. Veteran teacher Denise Pope follows five highly regarded students through a school year and discovers that these young people believe getting ahead requires manipulating the system, scheming, lying and cheating.